The Green Hornet started as a radio series in 1936. The story was aired on the same stations as The Lone Ranger. In fact The Green Hornet followed many of the same plot elements as The Lone Ranger, a masked hero and sidekick fight crime as vigilantes, with the major difference being that The Green Hornet was set in modern (1936) times. 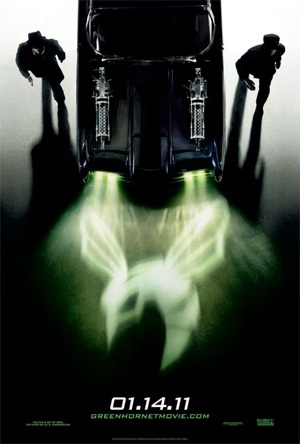 The Green Hornet has been adapted into several comics, a film series and a TV series staring Bruce Lee in his debut role. The 2011 movie is an insult to all respected mediums that star The Green Hornet. This new release has a paper-thin plot, repetitive action scenes and an unlikable hero. The plot follows Britt Reid (Seth Rogan) as the son of a successful newspaper publisher. Britt is characterized as a greedy, unsuccessful brat who forces the word s— into every-other sentence he speaks. Britt is arrogant, talks too much and treats everyone like dirt. He hates his father and the idea of hard-work and success. This interpretation of The Green Hornet was co-written by Rogan, who wrote far too many lines for himself. It is not clear if audiences are supposed to dislike the character of Reid or not. In normal circumstances this kind of character becomes a nice guy at the end of the film, but Reid does not. If the character of Reid is supposed to be unlikable, Seth Rogan deserves credit for making the character so dislikeable. However, our super heroes are supposed to be heroic and kind. After his father is killed by a bee, Reid decides to team up with his father’s mechanic and kung fu master Kato (Jay Chou) to destroy a statue of Reid’s father. While committing this crime Reid witnesses other hooligans committing a different crime; beating an innocent girl. Reid tries to stop them but his masterly conceived plan of yelling, “Hey stop!” backfires and the other criminals chase him. He is saved by Kato in the first of many subsequent saves. Reid in his arrogant delusion thinks he and Kato have toppled the entire underworld by the defeat of these three petty criminals, and so decides they should become heroes! Yet, unlike other heroes, they should appear to be criminals themselves so they can get close to other villains. In memory of the animal that killed his father, Reid dons the persona of The Green Hornet because “The Green Bee was not ‘catchy’ enough.” Our ‘heroes’ start attacking random bad guys who all happen to belong to the only gang in California. So much for getting close to the bad guys. At this point, a sane person would stop trying to look like a bad guy. But no, Reid decides to have his newspaper continue to print that The Green Hornet is a villain. The plot of this caper has all the organized crime in California being controlled by a Russian villain, whose name is near-impossible to pronounce. After stopping a small percentage of organized crime, the Russian decides he wants The Green Hornet dead. There is also a woman, (Cameron Diaz) who appears to be in the movie only to be pretty. Unlike the kindness Batman shows to Robin, Reid, being the jerk he is, treats Kato like trash. This is despite the fact that Kato can hold his own, while Reid tends to get punched-out five seconds into a fight. Reid believes that Kato is worthless and he is better-off without him. This all makes no sense. Kato is the character who knows kung fu, built the cool car that he and Reid drive, and built The Green Hornet his trademark gas gun (This trademark gun, by the way, is not used in any action scenes). The plot of the story has no logic, is full of holes, and will leave audiences confused. Kato is an expert at martial arts, and the first scene he fights is cool. He is able to beat up the worst of L.A.’s thugs with no effort. But, the other fight scenes are repetitive, last too long and are boring. The sweet car our heroes drive follows the same guidelines as Kato’s fighting scenes. The car scenes are mostly in computer generated-imagery and last far longer than they should. The film really pushes the boundaries of its PG-13 rating. The film is very violent and is bursting at the seams with foul language. In one particularly violent scene the Hornet grabs two sharp objects and rams them into a thug’s eyes. This scene is silhouette but still graphic. This raises the question: Is a remake of a 1930s program which would have had little if any graphic violence or profanity, the place where directors test what they can get away with before their film earns a Restricted rating.? Hornet fans beware; this film is cruel to its source material. Site contents copyright © 2019 Recorder Online	except as noted. All rights reserved. | 90 queries in 2.236 seconds.